Step2:Save the slice file to SD card. Step3:Level platform when first print (No need to level again next time). Step4:Loosen the four screws on both sides of the platform. Step6:Press down the platform and tighten the four screws on both sides of the platform. Step8:Insert the SD card into the slot (Face down). How to Clean the Machine? The edge of the building platform can be cleaned using tissue or dust cloth and residual adhesive can be removed with a knife or spade and the residual adhesive in the tank should be removed with tweezers. The remaining resin can be absorbed using a syringe and stored in a bottle for next use. Loosen the two screws used to install resin tank and clean the tank with alcohol, and then reinstall it. 1.※When connecting the printer,You should plug in the DC port first,and then plug in the socket. 2.The SparkMaker 3D Printer should put in a place without strong light. 3.UV cover should be put on the SparkMaker Printer when printing. 4.The SD card’s capacity should not more than 32G and should be formatting when first use. 5.Avoid looking at UV light and you should wear goggles. KINDLY REFER USER MANUAL BEFORE USE. DESKTOP DESIGN: Only 6.6 pounds with a compact size of 170φ*275mm, Featuring a small footprint. Suitable for office, studio or home. READY TO PRINT: Unlike most other 3D printers, fully assembled and has already been calibrated at the factory. You can start printing right out of the box! OFFLINE PRINTING: Insert an SD card with a print file, press the print button and your design begins to take shape. Without connection problems. Easy to print. 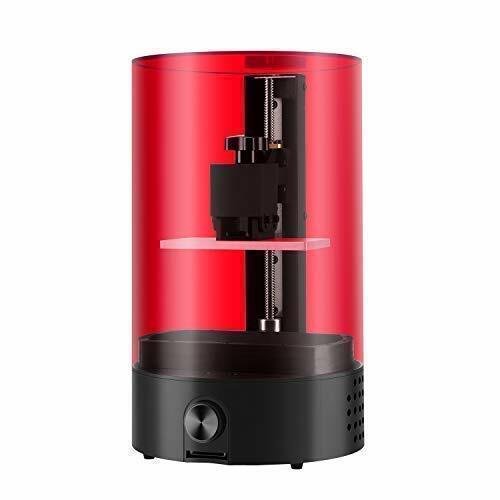 Printing at 100 micrometer XY resolution and up to 20 micrometer Z layer thickness, SparkMaker has an amazing ability to print in higher resolution compared to DLP 3D printers. WORRY-FREE WARRANTY: Unconditional return, if you have any question please feel free to contact us, we will reply your any product issue within 24 hours.